Cyclamen Graecum Greek cyclamen Κυκλάμινο ￼ Primulaceae - primrose family Dicot. Primulaceae - primrose family Dicot. The delightful flowers of Cyclamen graecum appear as if from nowhere after the first autumn rains. Growing amongst the trees, on the roadsides and in the olive groves, sometimes springing from small crevices in bare rocks. They are abundant in areas of burnt forest. The plants are very tolerant of difficult conditions and grow in dry, exposed, sunny sites; they survive by lying dormant underground during the hot summer months. The flowers vary from deep magenta to palest pink; the pale flowers having deeper markings at the base of petals. They are held on smooth curved unbranched leafless stems, with the flowers facing down, in an unusual posture, which is typical of cyclamens, the petals are reflexed forming two protuberances (auricles) at the angle of each petal, which often twisting into intriguing shapes. The leaves which appear after the flowers are heart shaped, bright green on upper surface with beautiful markings and purple on underside. 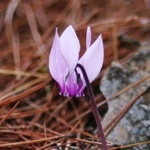 The plants can be differentiated from the otherwise similar Cyclamen hederifolia by their leaves. Cyclamen bulbs are poisonous but this rarely causes a problem, as they apparently taste awful.